To add to mutandrew's list, display boards are used because every day tourists and business travelers come into South Station or 30th St or wherever for the first and maybe only time, and don't want to download an app just to find the next train to Needham Heights. Maybe these visitors discover they forgot to arrange for data service in the place they have just arrived in, or that their expected service doesn't work. Maybe they can read the display sign, but don't understand the local language well enough to find their way through the relevant app. And people hurrying through the station don't necessarily want to pull out their phones and enter their pins and navigate to the app and search in the app when they could just look up at the board. And if the cell phone networks the or the wifi go down, the board can probably still work -- hardwired connection to computer, maybe an emergency backup power supply. For the same reason, we will continue to have street signs and traffic lights. The sound on the Boston board is terrible. Newark’s is all-around better. Some kind of sound should be a requirement. For people sitting reading the paper or buried in their laptops, the sound provides a useful heads-up that something on the board has just changed. If not the traditional Solari flipping sound, a not-too-obtrusive gong (electronic) might do, as long as it's not a harsh buzz. Backshophoss wrote: The "plan" is to send this board to RRMPA at Strasburg, so this board is being saved, and has a safe home to go to. That should include the control computer and any spare parts on hand. Red, why was the Baltimore Solari board stored not donated to the B&O Museum??? Actually, since I had time to double-check, it IS at the B&O Museum! I don't know if it is up on display or not. 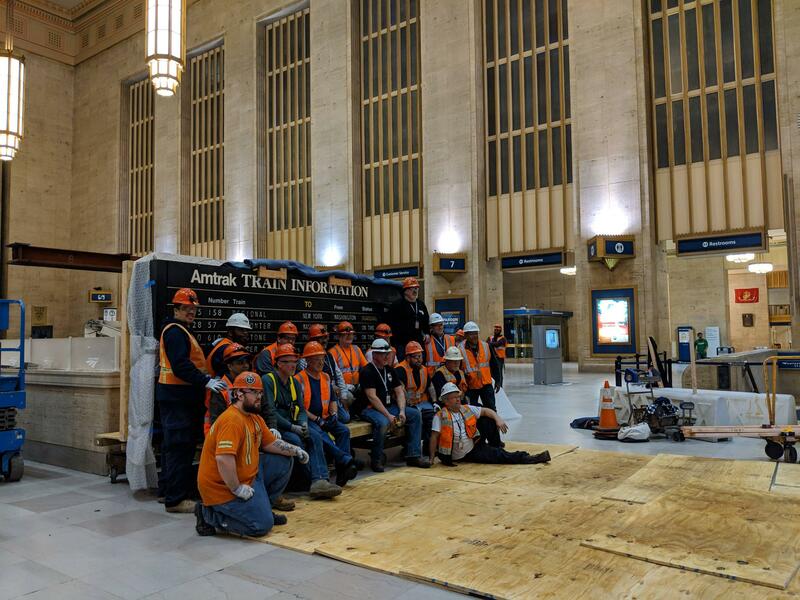 Penn Station's old board rests in storage at the B&O Railroad Museum in West Baltimore, where chief curator David Shackelford is happy to have it and eager to put it on display. Believe the B&O Museum had a roof collapse back then as well, hopefully it's still safe and undamaged. Reports came out about a week ago that the board was coming down Wednesday into Thursday. But that did not happen. Still up and running. The sign is coming down right now. Parts were removed Thursday evening and overnight, but the boards were still flipping Friday afternoon. 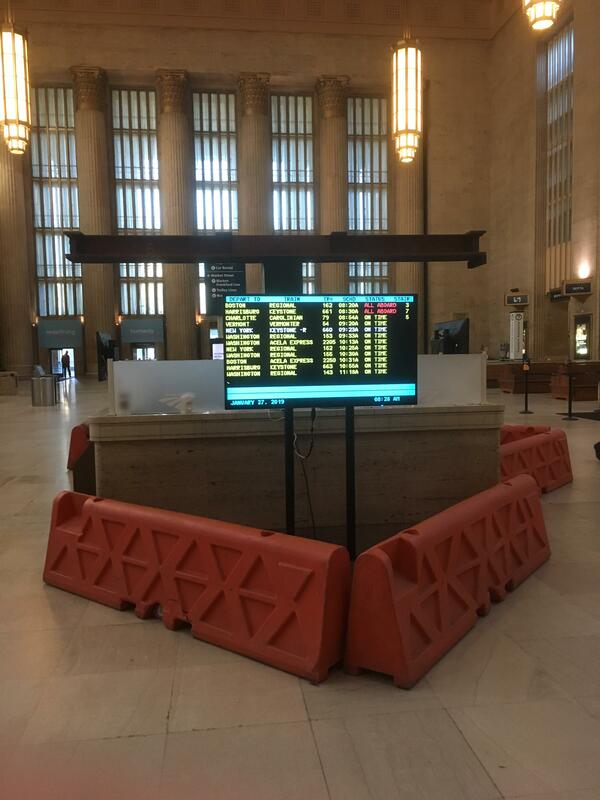 Friday morning before work, I went through 30th St Station to catch one final glimpse of the Solari Board in action. I was surprised to see many people in the main concourse doing the same as I was! Cameras out, and cellphones raised, travelers were gathered around the information desk taking their last pictures and videos of the "iconic" board. I even saw Channel 6 there interviewing people and loading up on their final bits of footage before the board comes down. board was situated north and south - with this second board facing east and west. of this board has generated interest from many - including Representative Boyle. Thanks for getting some video. I intended to the last time I was there, but I was taking train 66 and missed the single change on the board that occurred while I was in the station. Last edited by DutchRailnut on Sun Jan 27, 2019 2:51 pm, edited 3 times in total.